New easy way to get XDNA! We continue to work on integrating the project with various online services and simplifying its acquisition for people who are inexperienced in crypto world. 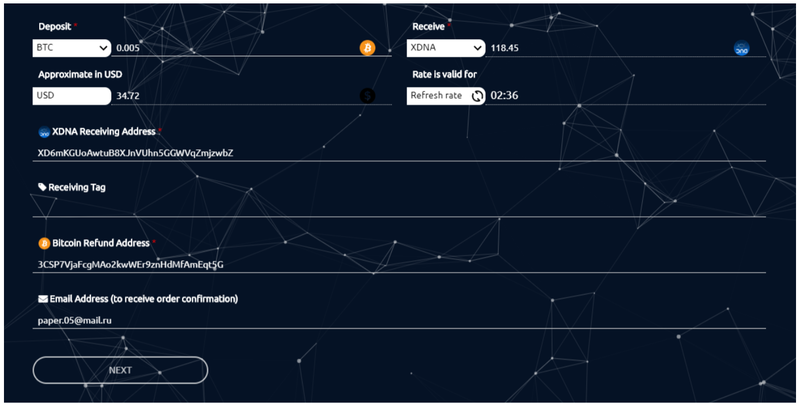 Now you can purchase XDNA without registering on the exchange! At the moment you have access to only a local wallet (for win, linux, mac), in addition to exchange analogues, but soon we will prepare more convenient versions of your wallet for you. Go to https://cryptowolf.eu/ and choose what altcoin we want to get and what altcoin are you going to give (available btc, eth and ltc).The minimum amount of exchange should be equivalent to $ 50. Next, the automatic bot will show how much you will get XDNA and fix the course for a short period of time. After a short wait, the announced XDNA will be delivered to your address, without registering on the exchange and analyzing how it all works!